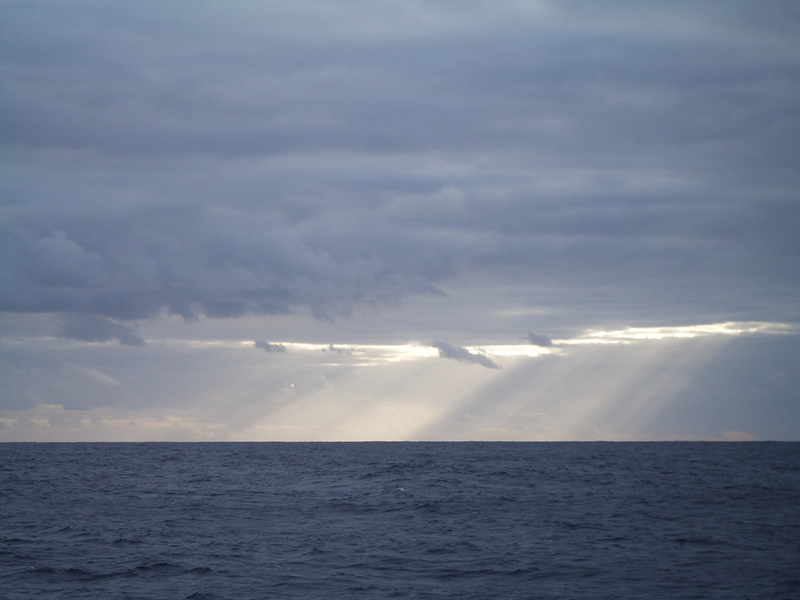 The ocean and atmosphere interact through air-sea fluxes. These fluxes, or exchanges, are the most direct ocean climate indicator of how the ocean influences climate and weather and their extremes, and of how the atmosphere forces ocean variability. 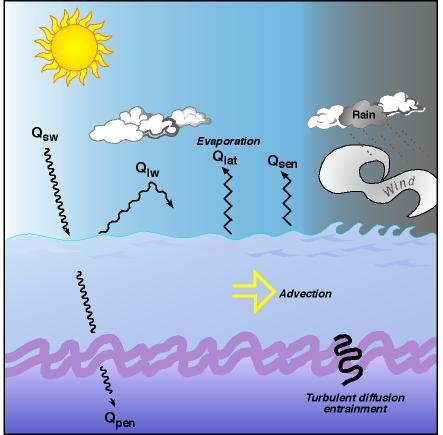 Momentum fluxes (wind stress) drive general ocean circulation, setting up the ocean gyres and current systems that can redistribute heat and properties within the ocean. Moisture fluxes (evaporation and precipitation) over the ocean are the source of water that supports life on the planet. Through the latent heat of evaporation, these moisture fluxes are linked to the air-sea fluxes of heat. Air-sea fluxes of heat are the primary mechanism by which the ocean influences the atmosphere. 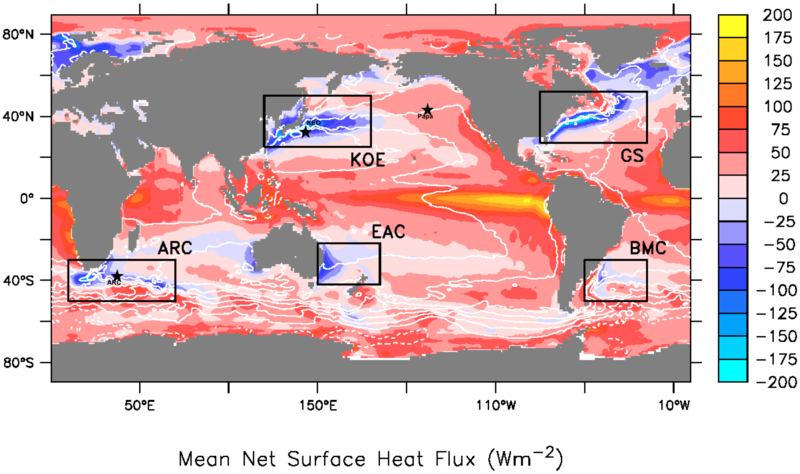 Map of the mean net surface heat flux into the ocean. White contours show the mean dynamic sea surface height. Boxes are western boundary current regions. OCS moorings are indicated by stars. OCS moorings directly measure meteorological and upper ocean properties. Through funding received from NOAA’s Climate Program Office in 2014, high-resolution air-sea fluxes are computed from OCS data, and made available through the Computed Fluxes data page. By comparing fluxes based on direct observations to fluxes computed by models, the models can be improved to more accurately reflect actual conditions. This will allow better understanding of weather and climate, as well as improved forecasts. More accurate forecasts directly lead to a more informed society, able to anticipate and respond to climate and its impacts.